Lorenzo Surfer Joe California Tour Winter 2019! 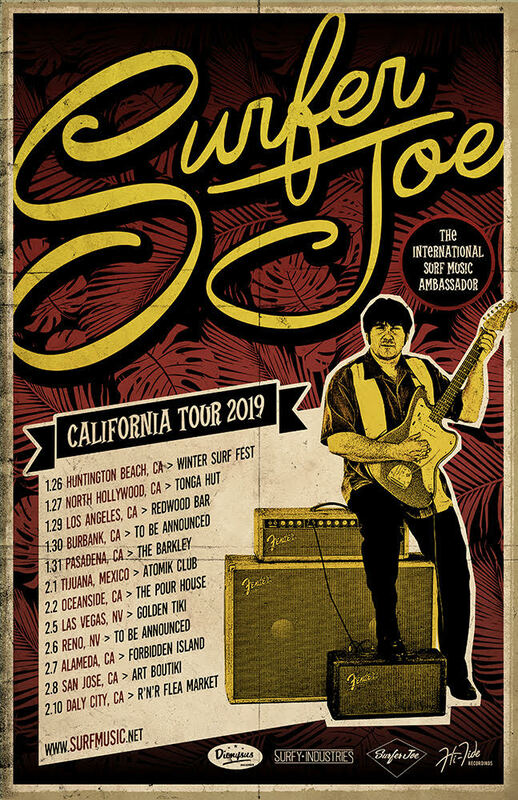 Lorenzo Surfer Joe California Tour Winter 2019! Surfer Joe, whose “Swell of Dwell” album was released on Dionysus Records this past summer will be returning to the USA for a (mostly) California tour! Here are the dates – watch Surfer Joe’s Facebook page for updates! No cover charge; however, donations strongly encouraged. Support the bands!!! For those who can’t wait till August, the organizers of the annual Surf Guitar 101 announce this year’s annual Winter Surf Fest ! There will be vendors selling surf music, T-shirts and more. Join us for an afternoon and early evening of reverb-drenched, Southern California sounds! 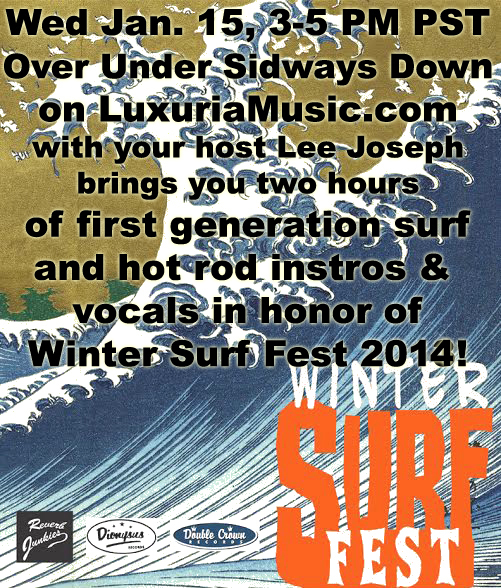 1/18: Winter Surf Fest 2014! $20.00 cover for the entire day! 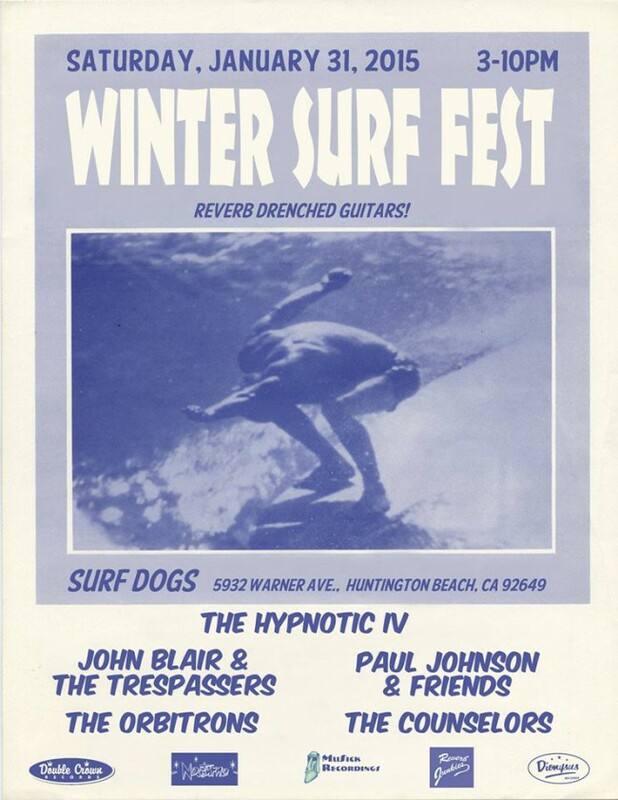 While the weather in Southern California might be getting colder this time of year, it certainly doesn’t affect the spirit of the thriving instrumental Surf Music scene. 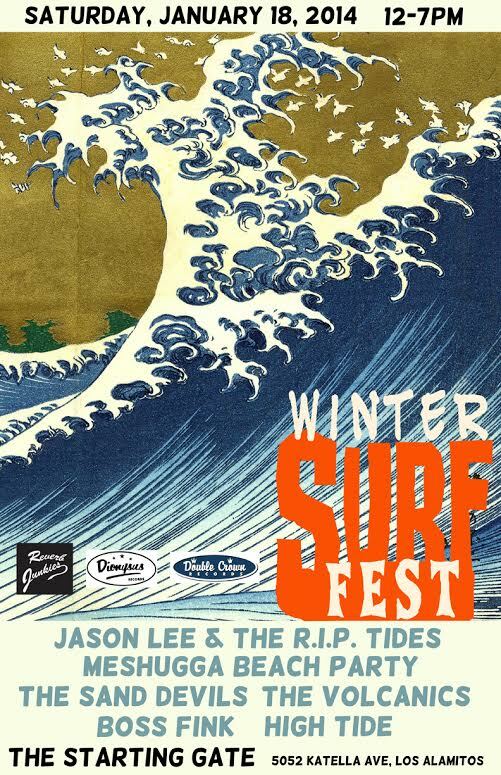 For the 3rd year in a row, the organizers responsible for one of the largest Surf Music events of the year, the SurfGuitar 101 Convention, have assembled some of the world’s best contemporary live Surf Music bands for an incredible seven-hour extravaganza of reverb-drenched guitar goodness at the 3rd Annual Winter Surf Fest. From the San Diego area comes Jason Lee and the R.I.P. Tides, a hard-edged trio that will be promoting the debut of their first full length LP on Dionysus Records. From Northern California comes the masters of traditional Jewish tunes gone Surf, Meshugga Beach Party, complete with beards, outfits and shtick. In a special reunion performance comes San Diego’s The Sand Devils, who bring their unmistakable brand of dark and ominous Surf. Local San Gabriel Valley favorites The Volcanics will don their trademark sweaters, take the listeners into a 60s time machine and perform many of the newer tunes from the recent release of their second album The Lonely One on Double Crown Records. Out of the ashes of one of the most influential of the 90’sSurf revival bands, The Ghastly Ones, comes Boss Fink, a Hot Rod-themed romp including former members of The Huntington Cads. And, rounding out the bill comes the day’s annual opener, High Tide, an all-star band featuring some of the best veteran players from the scene including members of The Torquays, The Planktones, The Reventlos and Insect Surfers. In addition to the exceptional talent on stage, the event will feature a shopping area spilling over with specialized vendors selling Surf Music records, CDs, posters, t-shirts, books, magazines, musical instruments and other related accessories and collectibles. The venue offers a full kitchen and bar throughout the show, so prepare to settle in, relax and enjoy an entire day of some of the very best pounding drums, throbbing bass, and dripping with reverb twangy guitars anywhere!